Set up on July 26, 1737 as Oley Monthly meeting by Philadelphia Quarterly. 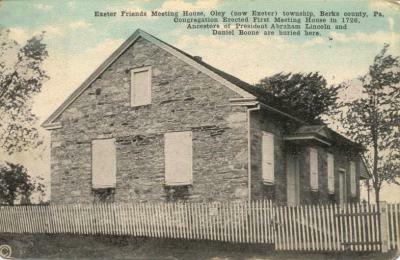 Meetings were held in meeting house of Oley Preparative near the home of George Boone, Jr., the first clerk. In 1742, the name was changed to Exeter to reflect the erection of Exeter township. The Hicksite branch was still in existence as late as 1888, but there is no further information about it. The Orthodox branch was discontinued in 1899 and its members attached to the Arch Street Meeting in Philadelphia. In 1949, a meeting for worship known as Old Exeter Particular was established under Caln Quarterly that became Exeter Monthly in 1955. Pre-Separation or Orthodox: Exeter Preparative, Maiden Creek Preparative, Robeson Preparative, Tulpehocken Indulged, Reading Preparative, Pottstown Indulged, Catawissa Preparative, Roaring Creek Indulged, Fishing Creek Indulged, Pottsville Indulged.